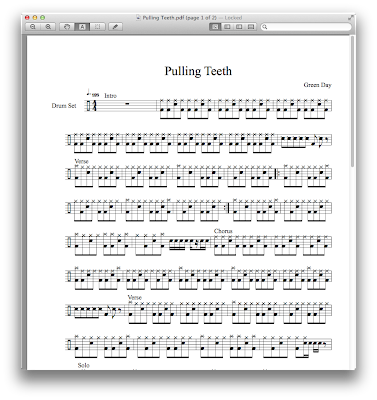 This will be relevant to exactly none of my regular readers, however please allow me to present, for your enjoyment, a transcript of Green Day's Pulling Teeth for the drum set. This is based on a drum tab transcription I found, with some corrections based on my own careful listening — please let me know if you think you have found an error. Share and enjoy, but if you've found this via Google please do link back to this page if you repost it anywhere. Click thumbnail below to download the full PDF.